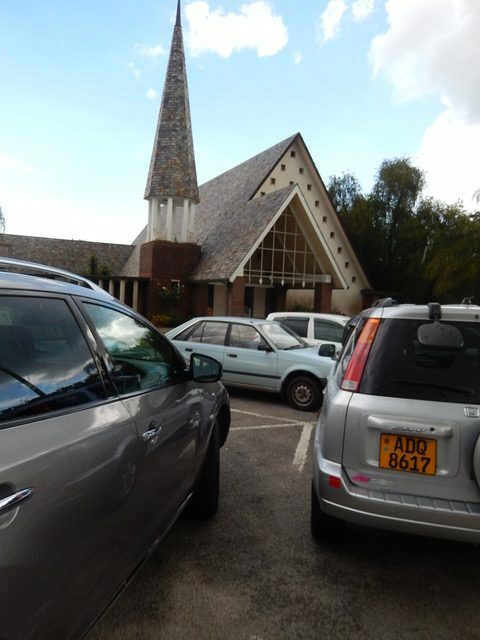 Please note that amendments have been made to the structure of the Obedience classes held on Sunday mornings at the Kennel Club of Harare. Please see the following details and if there are any queries, please speak to either Cherry Blake on 0772 326922 or your normal trainer on Sunday morning. 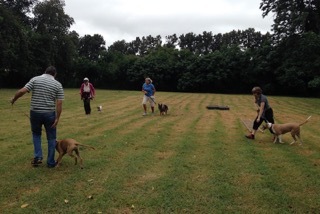 Puppy class – puppies up to 9 months. All new comers with dogs older than 9 months. Dogs coming out of Dave’s and Cherry’s class. Trainers class and dogs in Obedience Class A, B and C.
Show Beginners and Novice classes. 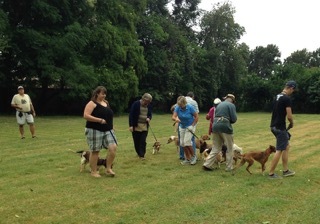 On a busy day Dave Lamb’s class has a lot of new dogs. Dave is always coming every Sunday to take his special class. 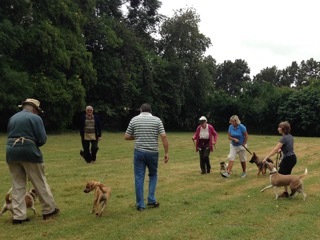 Dogs get obedience training and special socialising with each other with different breeds. Important for all. This entry was posted in Articles on 10 April 2016 by Ilse van Erp. 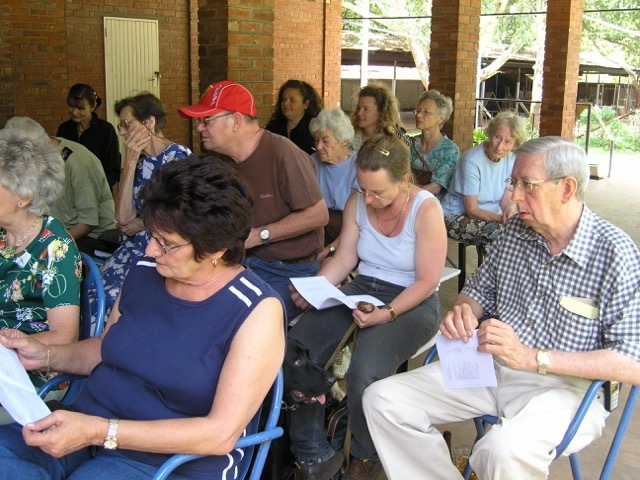 The working Breeds club of Mashonaland held their AGM on 21 February 2016 at the Kennel Club of Harare. The new committee was elected, the following members will remain on the committee : Mrs S Lamb, Ms G McLaughlan. The following members offered themselves for re-election and were duly voted in: Mr R Ellis, Mrs U McKinlay and Mr D Lamb. Presented were the trophies for the ‘Working Dog of the Year, the Dog Jumping Dog of the year, Agility Dog of the year, Obedience Dog of the year and Overal Working Dog of the year. The club held 3 Championship Shows in 2015 as well as a championship breed show. 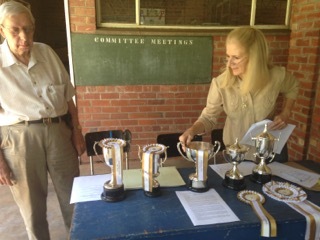 Roy Ellis and Geraldine McLaughlan showing the various trophies which were presented to the winners. 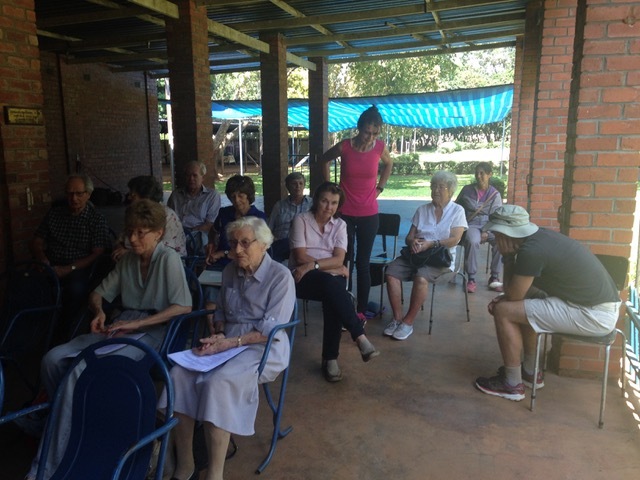 This entry was posted in Articles on 21 February 2016 by Ilse van Erp. 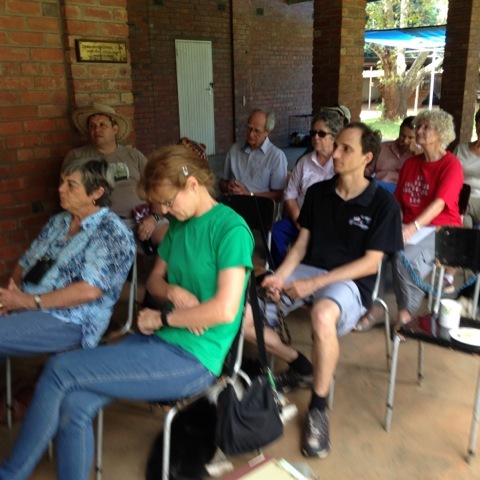 The Working Breeds Club of Mashonaland held their AGM on 22 February 2015. While the weather was dry and overcast, quite a lot of their members did attend. Geraldine McLaughlan does a sterling job and they hld quite a few shows over the past year. I would like to welcome you to the Working Breeds Club of Mashonaland’s 39th. 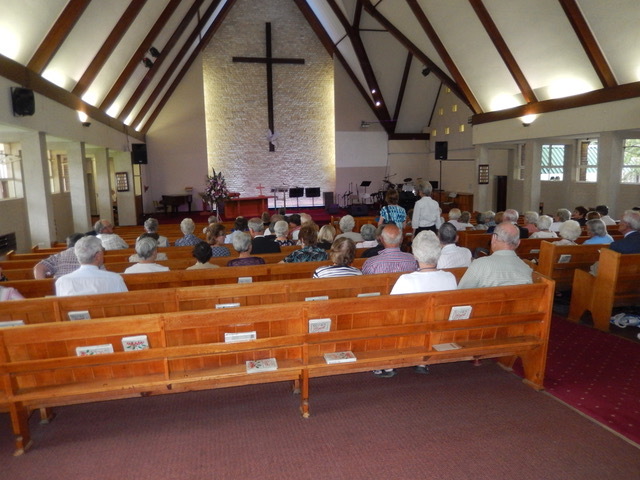 Annual General Meeting and thank you all for your support over the year. We held 3 Championship Shows in 2014. The first show was on 27, 28 and 29 June and consisted of Obedience, Dog Jumping and Agility shows plus a Working Trials training. 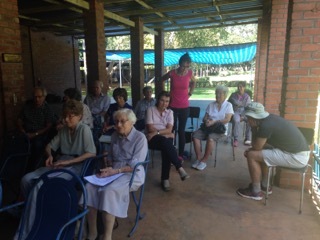 We were very lucky to have Mrs. Claire Patterson-Abrolat to come up and do the judging for the Agility and Obedience plus give some training tips on Working Trials, Tracker Trials, Obedience and Agility. 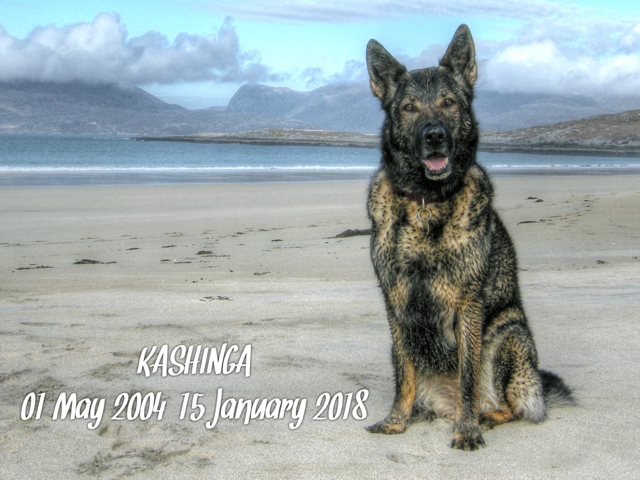 She is a member of the South African Agility Team, competes and judges in “C” Test Obedience and does a lot of competing and judging in Working Trials and Tracker Trials. Claire was a very good judge and very approachable. 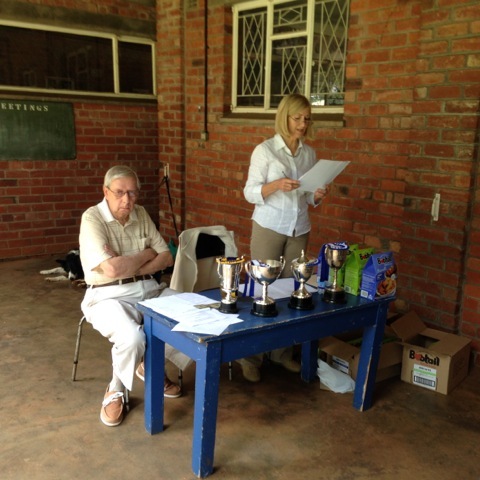 The Kennel Club of Harare obviously felt the same and have invited her to judge in 2015! The attendance at the Working Trials training was embarrassingly small. Thank you to Cherry and Bruce for hosting the event and giving lunch to the judge. I was unlucky enough to break my finger there when my dog leapt forward and a loop of the lead broke the finger. A lesson to be learnt. Unfortunately there were no qualifications in Obedience. Beginners was won by Debbie Christie’s Goldie, Tammy; Novice by Les Covarr’ Goldie, Josh; “A” Test by Dave Lamb’s Kirby; “B” Test by Cherry Blake’s Border Collie, Jed and “C” Test was won by Sam Fernandes’ GSD, Ciara. Sam Fernandes and her Australian Shepherd Myra were the only qualifiers in Dog Jumping with a win in Grade II. 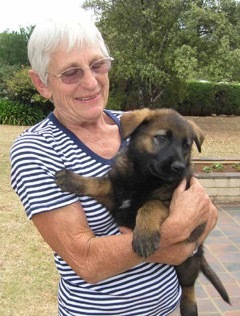 Bruce Freebairn and his GSD, Tilke won Grade I; Sue Carter’s Yorkie, Sammy, won Grade III and Gill Houghton’s Yorkie won Grade IV. Cherry Blake was the only qualifier in Agility with her Border Collie Jed. The other winners were Cherry and her Border Terrier, Kimble; Sue Carter’s Yorkie, Sammy and Paolo Cernuschi’s Border Collie, Chip. We had a Championship Breed show in August in conjunction with ZKC, KCH and the Midland Shows. Our judge was Mr. Graham Thompson from South Africa, who stepped in at virtually the last moment when another judge let us down. The Best in Show was won by Gordon Grierson’s GSD Rio vom Schloss der Hunde; Reserve Best in Show was won by Ursula McKinlay’s Border Collie Ch. Aitchie Tara; Third Best in Show was my Dobermann Ch. Hysand Quaesta von Colnetal and Fourth was Mrs. Todd’s Giant Schnauzer Lanstone Russel’s Boy. The second Obedience and Dog Jumping Championship Show was at the end of September. We had a few more qualifications: Debby Christie with her Goldie Tammy won Beginners with a qualification. Les Covarr and her Goldie, Josh won Novice and qualified with Ursula McKinlay’s Roxy coming second with a qualification; Bruce Freebairn and his GSD, Tilke, won “A” Test; Cherry Blake and her Border Collie Jed came first in “B” Test. Unfortunately due to the small number of entrants in the small dog classes, although some dogs jumped clear rounds, they couldn’t qualify. Cherry Blake and her Border Collie Jed won and qualified in Grade II Dog Jumping; Bruce Freebairn and his GSD, Tilke won Grade I; Sue Carter’s Sammy won Grade III and Lyn Pozzo’s Pedro won Grade IV. Thank you to all those who entered – it was much appreciated! Our congratulations to the various winners in all the shows. I would like to take the opportunity to thank the competitors, Judges, Stewards and other helpers for making the various shows a great success. Our main sponsors for the three shows were an anonymous donor, who gave loads of food. Thank you Anonymous Donor – your support was much appreciated!! Other main sponsors were the Jennings clan, Crystal Candy, Spinweave, Lokalize Investments and myself. The prizes certainly added to the shows! A big thanks must be given to the Working Breeds committee, namely Roy, Ursula, Sue and Dave, who have put a lot of effort into making the shows go off so well. The Corgi Club did their normal excellent job of manning the Show Office as did the KCH Catering section. This is the section of my speech when I mention any one who has passed on during the year. Please could we have a few moments to remember Derek Bowling-Scott who suffered for many years. I would now like to hand you over to the Treasurer, Mr. Roy Ellis, who will explain the Balance Sheets and answer any queries. Finally, I would like to announce the various trophies. Unfortunately with a hiccup in delivery, the dog food has been delayed. The dog food will be delivered to the various people within the next week or two. The Working Dog of the Year goes to Gordon Grierson’s GSD Rio vom Schloss der Hunde with 70 points; Reserve was my Dobermann Ch. Hysand Quaesta con Colnetal with 30 points; Tie Third was Ursula McKinlay’s Border Collie Ch. 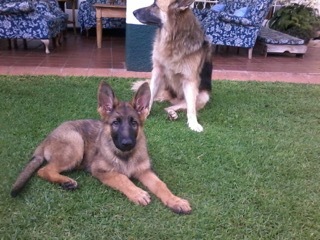 Aitchie Tara and my Dobermann Ch. Haverhill Harko von Colnetal with 17 points. Fifth was Mrs. Todd’s Giant Schnauzer Lanstone Russel’s Boy with 11 points . Gordon – please could you come and accept the Rosette and Trophy? The winner of the Obedience Dog of the Year is Ursula McKinlay’s Border Collie Roxie with 5 points. There were 6 dogs tied on 3 points each. I have graded them as to the Class they qualified in – obviously a dog who qualified in “B” Test would be rated higher than a dog who qualified in a more junior class like Beginners. So second was Cherry Blake’s Border Collie, Jed; third was Irene Kilpert’s GSD Maggie; Tie fourth was Erica Cunma’s Goldie Keisha and Lesley Covarr’s Goldie Josh. Tie sixth was Debbie Christie’s Goldie Tammy and Collette Beechey’s Jack Russell Milo. Obviously Border Collies and Goldies have shown the other breeds up! Ursula – please come forward and accept the trophy and Rosette. There were virtually no qualifications in Dog Jumping, which was very disappointing. Although the Mini Dogs jumped some clear rounds, because there were not enough dogs in their class, they didn’t qualify. There needed to be three dogs competing in a class for a qualification to count. This has been proposed to be changed to two dogs in a class. There were two dogs tied on two points each. So the winners of the Dog Jumping Dog of the Year are Cherry Blake’s Border Collie, Jed, and Sam Fernandes’ Australian Shepherd, Myra. Well done Cherry and Sam! Cherry – please come forward and collect the Trophy and Rosette. You will have the trophy for the first 6 months and Sam can have it afterwards. But don’t sit down. There is a new trophy for Combined Contact and Non-Contact Agility Dog of the Year – this has been won by Cherry Blake’s Border Collie, Jed. I usually mention forthcoming shows here – we have a Championship Obedience and Dog Jumping show with local judges on 17 May 2015 and a proposed Championship Obedience and Dog Jumping show with local judges on 27 September 2015. On Friday I heard that a sponsor will donate a ticket for a judge for our Breed show. So with such short notice I can’t say much as I still have to discuss things with my Committee and the sponsor. Hopefully with the money from these shows, Working Breeds can import a South African Obedience judge in 2016. This entry was posted in Articles on 25 February 2015 by Ilse van Erp. I started entering Working Trials in 1980 and so met both Sisley’s since then. 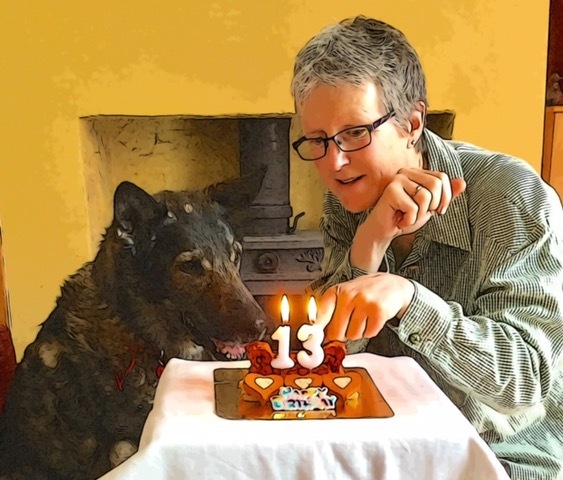 Entered with Freya, Antoinette, Gero, Kali and finally with Saxon, so it has been a long and fantastic time with these dogs being judged by both Jane and Tony [who passed away on 4 December 1990]. I was undergoing treatment in the possible time of prolonging the worst prognosis of 3 months to who knows, a year maybe three if I am very lucky. Please don’t be sad. I am at peace with the idea of dying and have been since I was in my fifties. I have had a full, productive life, pushed the boundaries and achieved. This year alone I have had a most enjoyable holiday in Australia with Anthony, Sue and Kim. What a lovely country. Makes me wish I had tried much harder to persuade Tony to go in 1980. I returned to England to the joyous news of the birth of the latest Sisley: James Anthony, born on 27 March to Matthew and Leanne in Dublin. Suddenly my life is easy and I know what is important and what I can discard. I consider myself lucky to have a little time to enjoy what is left and get my life in order. I thought the best way to bring us up to date, as you said you were wondering where we were, was to give you a potted history since we left Zimbabwe in April 2005. By 2003, both my eldest son, Anthony, and his family had left for the UK followed shortly afterwards by Jonathan, my middle son. They settled in Maidstone, Kent, where their father was born, and invited me to come over for Christmas 2003. 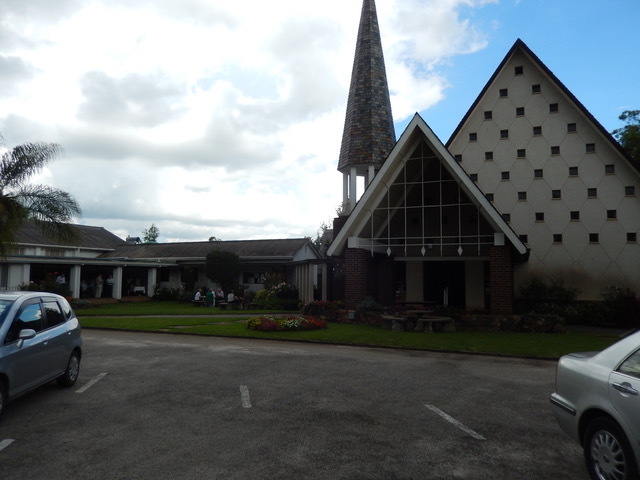 Things were getting pretty tough for older people in Zimbabwe if you didn’t have plenty of money and whilst I was here I decided that I would sell up and that we would come back to England which we finally managed at the end of April 2005. Peter’s mother lived in Rustington, East Sussex and he was educated in the country so we initially stayed with her until Peter got a job in Portslade, next to Brighton and Hove, East Sussex. I fell in love with Hove in spite of never having been here before and we initially had a very quirky basement flat with glass doors, an enormous mirror in the bedroom and cushion flooring in black and white squares. The architecture all around is magnificent, Georgian and Victorian and when you walk on the promenade by the sea you can almost imagine the ladies with their parasols from bygone days strolling beside you. Brighton is very vibrant, full of night life, and at the moment with the World Cup on and it being summer, is full of holiday makers and rocking 24/7. Unfortunately, Peter was made redundant and our landlord decided to move back to Hove, but we were fortunate to find a very nice fourth-floor, purpose built seventies flat a block down the road. It is light, airy and has a splendid view. We are very close to the sea and on quiet nights I can hear it when I am in bed. Peter did manage to get a couple more temporary jobs and applied for numerous others without result. Being in your later fifties you don’t have much chance, which is a pity as I think older people have such a wealth of experience to impart. Now we are both pensioners with the attendant perks and live a reasonably comfortable life. Matthew, my youngest came over in 2006, found Ireland friendlier than England and settled in Dublin where he works in computers. He married his fiancee, Leanne, four years ago and in March this year their son, James Anthony, was born. The new Sisley to carry the name into the future. Anthony, in the meantime, finally achieved his dream and was offered a job in Australia. They are now at the stage of getting permanent residence and I very much hope that they are successful as life there is better than it is here. I spent three lovely weeks there in March and it gives the impression of a country that cares about itself. The people are very friendly and the shop assistants actually want to help you which isn’t always the case here. Jonathan is still in Maidstone with his fiancee, Lucy, a mature woman in her 50’s. He works in engineering and seems happy. As they are about an hour’s travel away we see them fairly regularly which is nice. So far Jane’s history, which I thought would be nice to read for all who knew her and Tony and later Peter. I wonder if her love for Labradors, they bred mostly the black and chocolate colours still have any progeny left in Zimbabwe? This entry was posted in Articles on 19 August 2014 by Ilse van Erp. I would think these might only be available in S Africa for our pets. Prescription needed from your Veterinarian. I know of one dog who became very agitated at day 2 and when collars as taken of she settled again, so do remember that they could be allergic to them, but otherwise very economical and it lasts for 8 months. Today, most flea and tick treatments require monthly applications. With such busy personal and professional lives, it’s not surprising that many people find it difficult to remember when re-treatment is required. Seresto® now offers an easy solution to this problem by offering up to 8 months of protection with a single application. It’s a simple way to ensure you’re doing the right thing for your cat or dog, while helping you keep fleas and ticks successfully under control. Collars in available in 2 sizes – Small (Dogs less than 8kg) and Large (Dogs over 8kg). This entry was posted in Articles on 21 June 2014 by Ilse van Erp.